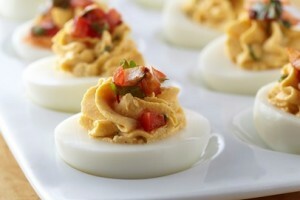 Deviled Eggs – they are everywhere these days! The long loved classic-style made with mustard, mayo and some pickle relish is a popular picnic and party favorite. But these days deviled eggs are getting all dressed up. Steak and eggs? Yes, we have a deviled egg for that! Just mix up the yolks with a little A1 steak sauce and a touch of mayo – fill and top with a small slice of grilled steak. For those that like it spicy, you’ll love my Wasabi Deviled Eggs. Wasabi paste, green onion, a touch of mayo and tiny diced cucumber get mixed with the yolk. I like to top this one with a spicy wasabi pea for a crunchy fun garnish!! Who’s ready for a bite of Wasabi Deviled Eggs? 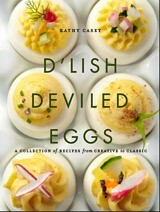 Photos from D’Lish Deviled Eggs. Or how about getting your fiesta on with my Chipotle Deviled Eggs: add in some chipotle to deviled egg filling, then top with a little fresh salsa and pieces of crunchy corn chips. Have trouble peeling your hard boiled eggs? Well here’s a tip: roll them on the counter (gently) then peel under running water so the shells slip off easily. Available in book stores, at the Food Studios, and online! Wasabi adds a creative kick of heat, and crisp, fresh cucumber adds textural crunch to these bold eggs. Top these little green devils with a wasabi pea for a fun finish. Halve the eggs lengthwise and transfer the yolks to a mixing bowl. Set the egg white halves on a platter, cover, and refrigerate. With a fork, mash the yolks to a smooth consistency. Add the mayonnaise and wasabi paste, and mix until smooth. (You can also do this in a mixing bowl with a whip attachment.) Stir in the green onion and cucumber. Spoon the mixture into a pastry bag fitted with a plain or large star tip, then pipe the mixture evenly into the egg white halves. Or fill the eggs with a spoon, dividing the filling evenly. Top each egg half with a wasabi pea, whole or cracked. I’ve been making these for years and they have become a cocktail-party staple. The spicy tomato topping adds textural and visual pizzazz. Serve these with your favorite margarita for a perfect pairing. With a fork, mash the yolks to a smooth consistency. Add the mayonnaise, sour cream, mustard, chipotle purée, garlic, and salt, and mix until smooth. (You can also do this in a mixing bowl with a whip attachment.) Stir in the green onion. To make the topping, in a small bowl, mix together the tomatoes, onion, cilantro, and chipotle purée. Top each egg half with about 1 tsp of the topping. Tip: To make chipotle chile purée, place canned chipotle peppers in adobo sauce, with the sauce, in a food processor or blender and purée until smooth. Freeze any extra purée for another use. Place the eggs in a large nonreactive saucepan and add cold water to 1 inch above the eggs. Bring to a boil over medium-high heat. Turn off the heat and let the eggs sit for 10 minutes. Remove from the stove and run cool water over the eggs in the pan until they are cooled. When cool, carefully peel them under running water. Who would have thought that carrots would be the next “it” veggie? 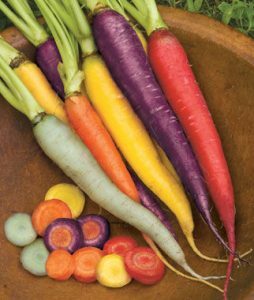 Nowadays, the quintessential orange carrot we have come to love has close competition with some unexpectedly colorful varieties. Typically found at your local farmer’s market, these beautiful heirlooms come in wonderful shades of purple, ruby, yellow and white. 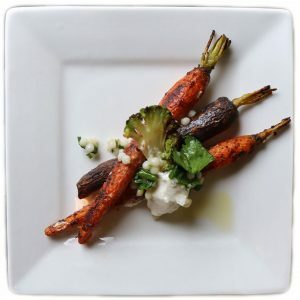 I like to pick-up a bundle of fresh heirloom carrots, rub them with some olive oil and flavorful seasoning like Duqqa; an aromatic Egyptian mixture of toasted nuts and seeds like hazelnuts, sesame seeds, coriander and cumin, or Harissa then roast them in a hot oven and top with a dollop of Greek yogurt and a scattering of fresh cilantro. The roasting brings out the sweetness and the spices really compliment the carrot flavor. Oh and don’t be afraid to char the carrots a little – they can handle it – yum! Of course we all enjoy carrots as the perfect snack too, sweet and satisfyingly crunchy – they are filled with antioxidants, Vitamin A and C, beta-carotene, minerals, fiber and so much more yet are still a low calorie treat. For a great appetizer, try roasting and pureeing carrots with garlic and lemon for a simple carrot hummus or blending them into a gingery salad dressing! The fresh pressed carrot juice makes the color of this cocktail amazing! Besides baking into a sweet carrot cake, or roasting with warm spices, I also love drinking carrot juice too! 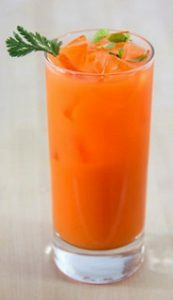 Because of their bright color and sweet flavor, I love adding fresh carrot juice to citrusy drinks like lemon – or limeades, sparkling water, and of course, cocktails. 12 heirloom carrots peeled and split in half, leaving about an inch of stem. Preheat oven to 475 degrees. Combine the Harissa paste with the olive oil in a small bowl and mix together until well combined. Toss the carrots in the harissa mixture until nicely coated then add to a roasting pan, being sure carrots are evenly separated and not overlapping. Roast the carrots for 10 minutes or until the carrots are tender and have a nice char to your liking. Once you are ready to serve, plate the carrots and dollop with Greek yogurt. I like serving this with warm couscous, drizzled with olive oil and a sprinkling of finishing salt. Measure gin, Honey Mint Syrup and juices into a mixing glass. Fill with ice, cap and shake vigorously. Pour drink into a Collins glass and top with soda. Garnish. Combine ingredients in small saucepan. On medium-high heat, bring liquid to a boil while siring to combine well. Immediately reduce heat to low, and simmer for 1 minute. Remove from heat and let steep for 45 minutes. Strain and store refrigerated for up to two weeks. When we say the word “spice” these days, people will most likely think of something spicy and chili-forward but today I want to shed some light on the warm spices – like aromatic cloves, nutmeg, ginger, allspice and of course cinnamon. They’re not just for apple pie, cookies and cinnamon rolls either. In ancient times, spices were used as currency to do all types of trade and these warm spices have been used from Morocco to China for thousands of years. In the Middle East, you will commonly find these flavors used for savory rubs on meats like lamb and in curries and stews. In India, cinnamon will often be used to flavor rice. They are not only delicious, lots of research has shown these spices have been linked to amazing health benefits, like reducing blood pressure, improving cholesterol levels, and lowering heart disease risks. Grandma may have told you to chew on a clove for a toothache, but now we know it’s because they’re great as an anti-inflammatory and have beneficial antioxidants. Did you know allspice has amazing detoxifying benefits too? It’s easy to spice things up with these warm and flavorful spices. If you’re a juicer, try adding a pinch of your favorite aromatic spice blend to your recipe, or add in a cinnamon stick and a few cloves to your next batch of steamed rice, pasta sauce, or vegetables stew. 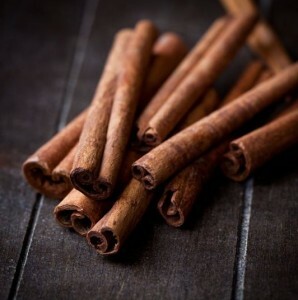 For something sweet, mix 1/4 teaspoon of cinnamon and nutmeg into your favorite cocoa mix for a wonderful hot cocoa. They also add wonderful warmth to coffees and teas. If you toast your spices before you add them to your dishes, it opens them up and brings out their flavors even more. Apply spice blends more liberally than just salt and pepper since there are a lot of other ingredients besides the S&P. Also, you may want to put the spices on meat and seafoods a little while before cooking to allow the flavors time to penetrate. Use about 1/8 – 1/4 teaspoon per large shrimp or scallop, about 1/2 teaspoon per small chicken breast or fish fillet, and about 3/4 – 1 teaspoon for a large steak. A great blend to season up chicken, lamb, pork, grilled eggplant, onions or white fish. Mix ingredients together well. Store in an airtight container if not using immediately. Be sure to re-mix after storing because ingredients will settle out a bit. Sprinkle on tuna, salmon, chicken, duck, pork, sautéed or roasted carrots, steamed rice, or use in a quick onion or cucumber pickle. In a spice grinder or small coffee grinder, process spices to a medium-ground consistency; do not grind too fine. Mix spices with salt and sugar. Copyright 2016 by Kathy Casey. From party staples like gooey, cheese fondue to classic French onion or 7-layer fiesta dip, we all have our favorites. These days dips are getting lighter and healthier. We’re whipping up our favorites not with full fat sour cream and mayo but with Greek yogurt as well as lite sour creams and mayos. Even this party staple can’t escape the better-for-you revolution! Hummus is all the rage lately – made with protein-rich garbanzo beans. It’s quick-and-easy to make from scratch, but also available in a wide variety of flavors like roasted pepper and sun-dried tomatoes. Cruise the hummus isle these days and you’ll find brilliant beet hummus and emerald green edamame varieties! Creamy white bean dips are also popular and fall into the better-for-you category, too. It’s tasty paired with bold flavors like in my Tuscan White Bean Dip Layered with Green Olive and Lemon Tapenade. Now, we all love our dips with potato and tortilla chips but you can also lighten up your dippables. 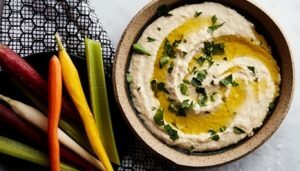 Try something new, like pita chips and rice crackers, OR go the veggie route with endive leaves, slices of crunchy fennel, or colorful bell pepper. I love to make the tapenade with those brilliant green Castelvetrano olives available at olive bars. If you want to take some extra time and pit them rather than buying pitted jarred olives, it is worth it! I like to serve this dip with pita chips or rustic crackers. To make the dip: In a food processor, combine the drained beans, cheese, if using, and garlic, and process for about 1 minute. Scrape down the sides of the bowl and add the pepper flakes, lemon juice and zest, rosemary and salt. With the motor running, add the oil through the feed tube in a slow stream. Process until smooth. Taste for salt and adjust if desired. Store the dip, covered and refrigerated, for up to 3 days. To make the tapenade: In a food processor, combine the olives, garlic, lemon juice and zest, and oil, and pulse till the ingredients are thoroughly chopped, but still have some coarseness to them. Add the parsley and sundried tomatoes and pulse until just integrated. The tapenade can be stored, covered and refrigerated, for up to 1 week. To serve: Put the dip in a pretty bowl, smooth out the surface, then layer the tapenade on top. Drizzle with a tiny bit of olive oil, and garnish with the rosemary. Oh bitters! In the beverage world, we like to call them the “salt & pepper” of drinks. They can add an extra oomph! to a cocktail – oftentimes, enhancing the overall drink and adding an extra layer of flavor. But did you know that you can also cook with bitters too? From appetizers to main dishes – and yes, even sweets! – a dash of bitters goes a long way. Take for example, my “Not Your Mama’s” Old Fashioned Cheeseball – 4 different cheeses, Worcestershire sauce, Dijon mustard, brandy, and Angostura Bitters come together for a party pleaser. Photo by Kathy Casey Food Studios® for Angostura®. Or how about whipping up a batch of Bitter Orange Garlic Butter? Sauté with shrimp and add in a handful of fresh basil leaves, and serve on pasta – yum! Bitters are oh-s- tasty in sweets too, like in my favorite new cookie – Bittersnaps. A generous helping of aromatic bitters adds an amazing layer of flavor to this classic cookie! Goes great with coffee or a glass of milk! This boozy and bold flavored cheeseball will be the centerpiece of any appetizer spread. Serve with artisan crackers, crostini or veggies. Add in a big handful of cooked minced bacon or minced salami to switch things up. You can also divide this recipe into 4 smaller balls and package up in glassine for tasty holiday party gift-giving. Bring out to room-temp for 30 minutes prior to serving. Grate the cheeses into a medium bowl and set aside. In a mixer mix with paddle attachment, mix together the cream cheese and grated cheeses on medium speed for about 6 minutes. Scrape the sides of the bowl with a rubber spatula, and then add the remaining ingredients (except the nuts). Mix starting on low speed. Increase speed to high for about another 6 – 8 minutes, or until mixture is well blended (scrape the sides of the bowl a couple of time in this process). Cover and refrigerate mixture in bowl for about 1 hour to firm up. Once cheese mixture is well chilled, form into a well-compacted ball. Then place toasted nuts in a bowl and roll cheeseball in nuts, pressing them in with your hands to coat well. 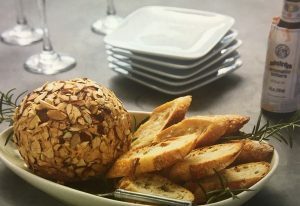 Transfer your cheese ball to the center of a large piece of plastic wrap, and bring the sides of the plastic up to the center – firmly twisting it to help the ball stay in a round shape. Refrigerate up to 2 weeks tightly wrapped. *Toast nuts in a pre-heated 350°F oven for about 6 – 8 minutes. Cool before using. Recipe by Kathy Casey Food Studios® for Angostura®. Serve this bold flavored shrimp as a main course or over your favorite pasta. Make extra butter for tossing with steamed veggies or slather over grilled steak or fish. To make the butter: whip together all ingredients until well combined. Refrigerate until needed. Bring to room temperature before using. To cook the shrimp: heat the olive oil in a large, nonstick skillet or sauté pan over high heat. Add the shrimp to the hot pan and start turning after 30 seconds. Cook for about 1 minute or until just starting to turn pink. After an additional 30 seconds deglaze the pan with white wine, and squeeze in the lemon. Let reduce for about 30 seconds and then add the basil, tomato and dollops of Bitter Orange Garlic Butter – swirling pan to emulsify the butter into sauce. Once combined, remove pan from heat and season with salt and pepper to taste. Serve immediately. Switch up your cookie repertoire with these Angostura Aromatic Bitters infused ginger snaps. Try using coarse sugar on top of the cookies for an extra sparkly effect! Preheat oven to 375°F. Line 3 sheet-pans with parchment paper. In a mixer, whip the sugar, shortening, and molasses together on medium-high speed until creamy. Then add the Angostura Aromatic Bitters and egg and mix again until well combined. Sift the flour, baking soda, salt and spices into a large bowl. Add the dry mixture into the mixer on low speed, mix until well combined. Stir in the candied ginger. Using a tablespoon, scoop 36 balls. Roll and then dip the tops into the sugar. Place 12 cookies evenly spaced, sugar side up, on each sheet-pan. Bake for about 12 – 14 minutes, or until golden. Let cool. Store at room temperature in a cookie tin for up to 2 weeks. Now that we’re into the New Year, it’s time to get on track with healthy eating and stick to a New Year’s Resolution! Sometimes with busy schedules lunch gets skipped or something less than healthy gets ordered in. Well consider taking a few hours on the weekend and building some great meals in jars to pack to work. Just pick up some pint and 1/2 pint canning jars with screw on lids. Then prepare some good-for-you components like quinoa, brown rice, roasted veggies, roasted chicken breast, and some cut up fresh veggies. Pack these up in jars, but make sure to plan your layers. For instance layer up some quinoa, roasted veggies, chicken – all deliciously topped with some healthy hummus or low-fat Greek yogurt. These will keep refrigerated for up to 3 days and are easy to pack to work. Try this idea for breakfast-on-the-go, too. Fresh fruits, a little healthy cereal for the crunch factor, and yogurt. Or try cooked oatmeal with diced apples, dried cranberries and some toasted nuts. 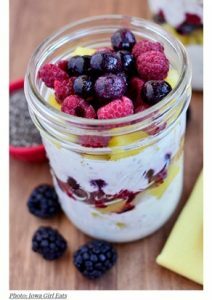 Check out this great recipe for Make-Ahead Fruit & Yogurt Breakfast Parfaits from Iowa Girl Eats blog using Chobani yogurt (my fave! ), gluten-free oats, chia seeds, and fruits. Her post is really inspiring! Pick 1-2 signature cocktail recipes and pre-batch them. Then supplement your signature drink(s) with red wine and champagne, or beers. And of course, have something festive for the designated drivers as well. For example, try my Festive Sparkling Rum Punch – made with rum, brandy, fresh juices, and homemade spiced syrup. You can make this up to a week in advance and refrigerate. Then, whip out that punch bowl from the closet and serve over a fun ice ring, then finish it off with champagne. Yum! For the non-imbiber my Rosemary POM Holiday Sparkle is a cheery combination of fresh rosemary, tangerines, pomegranate juice and sparkling apple cider! This punch is great to make ahead and then just add bubbles right before serving. Make a festive ice-ring to chill the punch, or serve over large ice balls – there are lots of molds available on line. To make the syrup: combine syrup ingredients in a medium sauce pan over medium-high heat. Bring to a boil, then reduce heat and simmer slowly for about 3 minutes. Remove pan from heat and let cool to room temperature before proceeding with recipe. Or you can prepare the syrup up to a week in advance and store refrigerated. Present in a large punch bowl. Add sparkling wine/champagne right before serving. 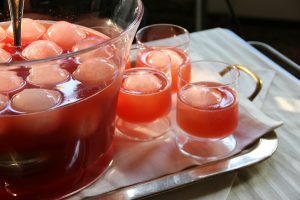 Serve punch in an old fashioned glass over ice or large ice balls. Fresh rosemary’s herbal essence complements the tangy flavor of the clementine and the sweetness of the sparkling cider. When making this in the Middle East, I substituted sparkling date cider instead of the apple cider! It was fantastic!